Minimalism, theatricality and architecture illustrate the essence of Colour by Norwegian designers Daniel Rybakken and Andreas Engesvik. In its refined simplicity free of conventional aesthetics, the light Colour expands the field of sculpture and light. 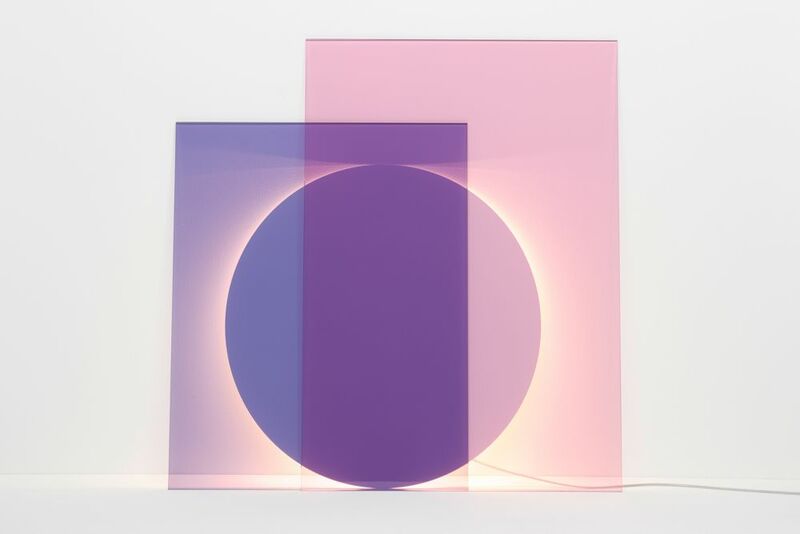 Open to individual compositions and leant against the wall, Colour consists of two slabs of coloured glass in pink and blue in combination with a circular form light diffuser in white. Inspired by natural changing light sceneries, Colour emits beautiful atmospheric light. Born in Norway, Andreas Engesvik studied Art History at the University of Bergen and Design at the National College of Art and Design. After graduating in 2000 with a Masters degree in Design, he founded the design company Norway Says. In 2009, Andreas Engesvik decided to continue as a solo designer and founded his own studio. Andreas Engesvik is working in diverse fields of design ranging from furniture and tableware to industrial design for international clients and has received a number of awards such as Red Dot Award, IF Product Design Award, Wallpaper* Design Award and many more. Since 2012, Andreas Engesvik is appointed as Guest Professor at the University College of Arts, Crafts and Design in Stockholm.